Learn how to use chained tasks to set up multiple revision cycles. In case your translation process requires multiple revision cycles, you may want to use our chained tasks along with the automatic key tagging. in translation tasks, items are closed either by updating, i.e. editing and/or saving a translation, or by clicking the Mark completed in task icon (yellow dot). in reviewal tasks, items are closed either by reviewing a translation, i.e. by clicking the reviewing icon, or by clicking the Mark completed in task icon (yellow dot). It is important to understand that the reviewed status (the "glasses" icon) in Lokalise is either reviewed or not reviewed. For multiple revision cycles in tasks, the reviewed status icon (the "glasses" icon) can only be used during the first reviewal task. In all the following revision cycles in tasks, the reviewed status icon (the "glasses" icon) will not be available as irrelevant during the tasks. The task assignees will only be operating the completed in task status. First, you create a translation task with the required scope, i.e. a set of keys and languages, and add the assignees. The chained reviewal tasks to follow will inherit the scope. At the same time, you will be able to assign them to other users as well. 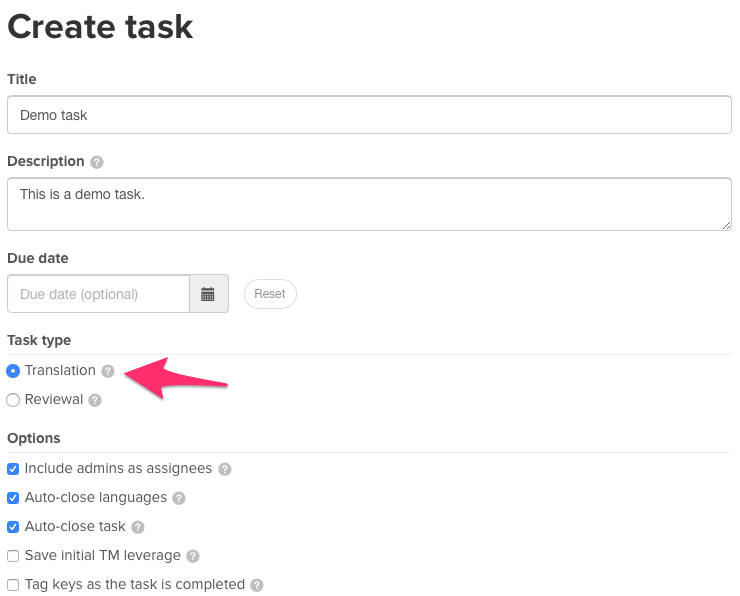 Next, create a chained reviewal task, and set the previous task as Parent. You may also wish to use the Tag keys as the task is completed checkbox. This way once all the items in the task are done and the task is closed, that tag will be applied to all the keys from the task scope. By filtering by such a tag, you will be able to select the keys which underwent a particular reviewal task, i.e. cycle. 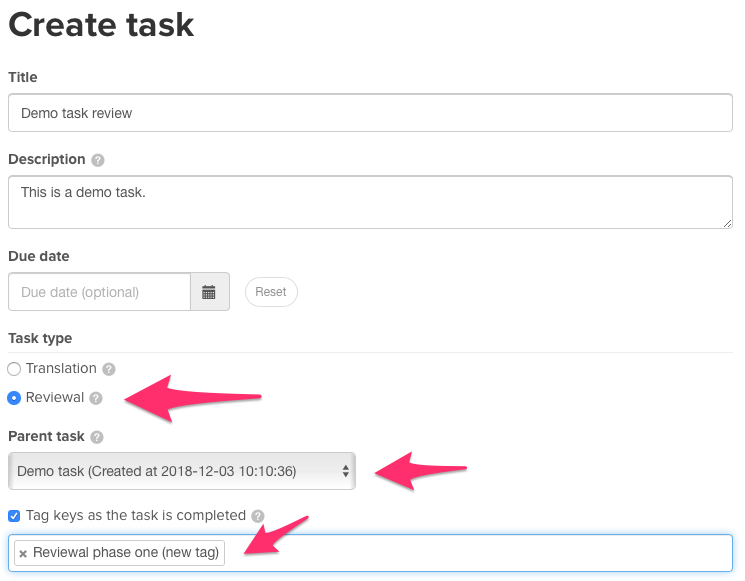 You can create as many reviewal tasks as your workflow requires, chaining them one to another and optionally adding the required tags to each reviewal step. Once again, as the reviewed status will be used in the first reviewal step, assignees must use yellow dot icon to mark items as completed in the task.